Maybe more than Americans, French people do like marshmallows. A lot. You see them in bakeries and pastry shops, often in long strands, on display either in lengths, or tied into knots, often stored in apothecary jars. It’s a tradition that goes back, before the advent of gelatin, when marshmallows were made with mallow extract which was (and still may be) considered good for your respiratory system. Nowadays the French eat lots of marshmallows, not necessarily on sweet potatoes (as some Americans do at Thanksgiving), but as a candy or le snack. And my local pharmacy still carries them…although I don’t think they’re covered by my health insurance. One of the most stunning marshmallow displays in Paris isn’t at a drugstore, though, it’s at Pain de Sucre in the Marais. A recent window featured big, crystal-clear jars filled with colorful, spongy cubes flavored with whiskey, angelica, matcha green tea, and my favorite—dark chocolate coated in flaked coconut. I gotta tell you, these chocolate ones are really tops in my book. They are the best of both world: chewy, sticky marshmallows with just the right amount of sturdiness so they’re not overly-gooey, with a sophisticated blast of deep-chocolate flavor provided by the richest cocoa powder which ensures they’re not overly sweet. The taste of chocolate doesn’t play a backseat to the marshmallow but melds beautifully with it. And the coconut? 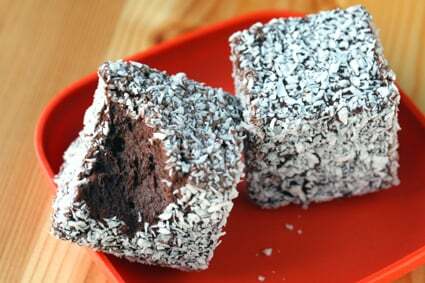 Well, for a chocolate-coconut lover like me, that’s a touch of extra icing on the cake, so to speak. All-in-all, these are the perfect confection. 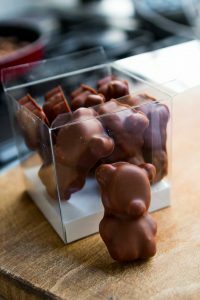 They also have little lollypop-like marshmallows dipped in chocolate, meant to be reminiscent of Oursons Guimauve, or marshmallow teddy bears enrobed in chocolate that kids—and a few adults…whose name I won’t mention—have an affection for. Depending on how you look at it, these are much too precious to melt over sweet potatoes. Which I’m sure my French friends are going to be breathing a sigh of relief over in the upcoming weeks. A recipe for my version of the chocolate marshmallows shown in the post can be found in The Sweet Life in Paris. so does that mean that there are gelatin-free marshmallows in france? i’m veggie and refuse to eat gelatin, but i do miss me some s’mores sometimes. selena: I’m sure everyone uses gelatin nowadays in Paris, as they do elsewhere. Pastry pal Elizabeth Falkner has a recipe for gelatin-free marshmallows in Demolition Desserts, the wildest baking book of the season! David, did I hear right? Did you really say marshmallows melted on sweet potatoes? It’s not just the French you’ve got to convince – and just as this English woman was beginning to feel she was getting to grips with the American cooking vibe. My God, they really look delicious! But have you used ’em to make S’Mores? I’m just imagining how good a chocolate-coconut marshmallow would be in a S’more! Thanks so much for the response and the information! I’ll check it out. Nice post David:) Their marshmallows are wonderful, though I found the chicory flavoured one a bit difficult. By the way, I hope you don’t mind me asking (my memory is fading) but aren’t they called Pain de Sucre? Yes, you’re right and I fixed that. Luckily I added the Google map link. Honestly, what did we (re: I) do before Google? Merci! looks absolutely delicious! I love coconut.. shall not give it a miss when I am in Paris next! Joanna – my family has been making a very simple recipe for years. You simply mash a large can of yams with a can of crushed pineapple, place it in a baking dish, and top with marshmallows and bake. The mini marshmallows are quite nice for this application, so you get a nice even crust all across the top. i love the rich, caramely moistness of your fresh ginger cake, would it be alright if i used the same base to try making a chocolate zucchini cake? i was considering substituting zucchini for the ginger and a hint of chilli powder for the pepper and 2 tbsp cocoa into the mixture. would the molasses work with the zucchini and cocoa? *so does that mean that there are gelatin-free *marshmallows in France? Yes, Selena. The artisans that make the real *nougat* often make the real *guimauve*. When it s called *marshmallow* or *chamallow* it s the industrial junk. When it s called *guimauve traditionnelle*, that should be made with arabic gum (gomme arabique), like the loukoums. The plant of marshmallow (guimauve) is for flavoring. Both are sold in French pharmacies. BTW, how do you make the *fluff* -if that s the name of the marshmallow spread sold in jars in the US ? Those look awesome. I love marshmallows, but I’ve only had the Jet-Puffed sold-in-bags variety. Have you made rice krispy treats for French people? A couple decades ago, I lived with a French family for a year and Maman’s head nearly exploded when I explained that I was going to melt a vat of (what was then sold primarily as children’s candy) and stir breakfast cereal into it and it would be dessert. It didn’t help that the only marshmallows I could find were multicolored (again, that kid’s candy thing) so when melted they turned a rather unappetizing grayish brown. My family wasn’t very impressed–but it sounds like maybe France has become more marshmallow-friendly since then? Or was I just living in a particularly benighted province? Although I blush to admit a love of jellied cranberry sauce in a can. Mmmmm. Like Jennifer Adams above, my mom’s recipe is right from the can of yams. Except, she scoops her sweet potato and pineapple filling into a graham cracker crust before layering miniature marshmallows on top and baking until they’re brown and melty. Although I don’t eat it any more (too much sugar for me), it used to be my favorite part of Thanksgiving dinner. Well, it used to be my favorite part of breakfast the following day. Thanks for the gorgeous marshmallow photos, David. Hi David, I’d love to try out your marshmallow recipe but here in England Corn Syrup isn’t very easy to find. Is there any suitable substitute? i had my first “guimauve” at louis XV in monaco, lavender flavoured. it tastes much better than the stuff they do in austria!!! i’ve also tried to make my own, strawberry flavoured one, but it sweated quite a bit… and i thought it wasn’t worth the effort! but guimauve in a good restaurant (or shop) – any day… in moderation! what food cannot be improved by plopping some caramelized sugar on top? Really. I’m all about the candy right now. I’m going to try it. although I wonder why someone hasn’t just cut out the middleman and made sweet potato marshmallows. I REALLY don’t think sweet potatoes need marshmallows – even if it is once a year. Don’t get me wrong, marshmallows are alright, but sweet potatoes taste so perfect and delicious on their own! Oh man, I was totally hoping for a recipe for those amazing-looking chocolat marshmallows. The strands of twisty marshmallows are also popular in the Middle East, I often see the pink and white twirls. By the way, we grow the mallow plant in our garden. It is a type of hibiscus and looks like this. When I lived in Paris twenty years ago, I prepared an entire Thanksgiving feast in my tiny apartment, complete with sweet potatoes which were topped with multicolored marshmallows. I can’t recall if I was the only one who ate them or not. Yup, I too see no reason to guild the lily…the sweet potato tastes so wonderful baked or roasted, split, with just some butter and/or a little brown sugar added, then under the broiler to caramelize…the industrial mini-marshmallows taste like styrofoam, IMHO. I hated the industrial taste of marshmallows in the states…when I tasted “guimauve” in France, it was quite a revelation. I prefer sweet potatos roasted with olive oil and sea salt. The caramelized sweet potato with salty olive oil is too yummy. Can not handle marshmallows on top. Maybe if they were olive oil marshmallows. Or salted caramel marshmallows. But…no. I’m pretty surprised, I really was not expecting to hear that the French were marshmallow lovers. It doesn’t seem like their type of thing. Thanks for the informative post! As always, thanks for an excellent post. Pain de Sucre est le bonne merde. 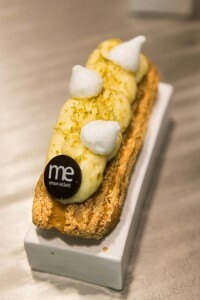 My partner and I usually stay in the Marais when we travel to the city of lights and 2 years ago our apartment was a mere 2 blocks from Pain de Sucre. I honestly think that their Tatre Citron might be the best I have ever eaten. ooh and their brioche is so buttery and delicious. It is good it is not here in Oakland or I would be 500 pounds by now. I cannot wait to see this veg marshmallow recipe. I too miss the mallow being a long time vegetarian and I once tried making them with agar agar but they would not set. It would be so exciting to get a recipe that realllly works. Basta! Now I finally know what “guimauve” means. I had no idea. Thanks for letting me know that there is a “real” marshmallow that has nothing to do with the fluffy industrial stuff. Wow. It’s nice to see I’m not the only one obsessed with marshmallows, or les guimauves. If anyone does try it with true guimauve, I’d like to hear about it. And yes, goodenoughcook, I’ve made Rice Krispie Treats for French friends…and they love ’em! And “guimauve” is probably my favorite word of all time. I read at http://www.chowhound.com/topics/410407 that that Jacques Genin is (or has already) opened a shop to the public. Do you know if he has a shop open to the public now? Reading about Pain de Sucre who used to sell his chocolates reminded me of this question. Donna: Last time I spoke with him, he told me about a project and showed me some plans, but I don’t know how public he wants that to be, so I’ll keep it under my hat. I will say that there was a tentative opening date this fall, which has just about passed…if the freezing weather outside is any indication. In my family, we treat sweet potatoes like mashed potatoes, then mix the mash with a orange zest, butter, and sprinkle the top with a bit of brown sugar before baking it to caramelize. We love the orange zest with the sweet potatoes, which are sweet enough on their own for us, and a little citrus juice also gives them some helpful acid. I wound up writing a post about how marshmallows should not be found on sweet potatoes. Just thought you should know about it. I’m sorry, I had to! Kuri – Thanks for that! 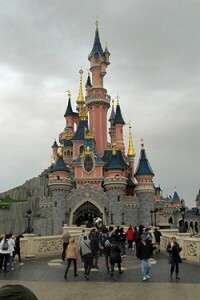 I’ll be on the look-out for the traditionnelle ones on my next visit to France. And the fluff is mostly egg whites, I think. Good for Rice Krispy treats, not so good for sweet potatoes. The only thing marshmallows are good for is a poor glue substitute when you’ve run out of glue and your kids are in the middle of their craft project. oh yeah and hiding in the bushes, shooting marshmallows with a marshmallow gun at people walking by. ok. maybe I need to taste your marshmallows. 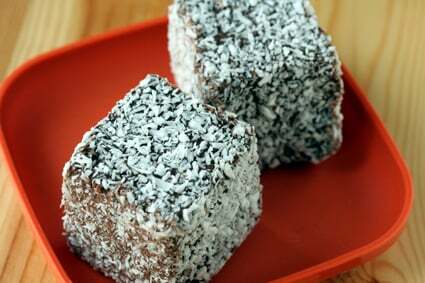 i thought these were lamingtons for a min! These marshmallow’s look divine.Is there any way u are going to attempt making these at home ?? C’mon u have to …then share it with us. Staying a 5-minute walk from PAIN DE SUCRE last trip, I got to know their Guimauve very well. And those big glass jars in the window became a touch stone for me. I’ve been planing to paint the chocolate covered marshmallow pops of theirs – now I will! I was surprised at how much I came to love French guimauve…I was sure it could never supplant US marshmallows in my heart but it did & it was a snap! Great article about marshmallows. I’m a fan.